eBay buyers are coming across a design change on the Checkout page that appears detrimental to PayPal. For some purchases, it makes their credit card number the default payment method and "hides" the option to pay with PayPal behind a link that reads "Show payment options." One reader told us, "The checkout page used to have PayPal already checked, but now it is credit card, and if you want other options like PayPal, you have to click on a pull down menu." As a result, he inadvertently paid for an eBay item with his credit card instead of PayPal. "I buy a dozen or more items a month and don't pay attention to payment info or my shipping address because it used to be the same all the time, and I didn't catch this change to the payment choice," he explained. The following screenshot shows how the checkout page appears for some purchases, according to two readers, one of whom noticed the change in mid-January. 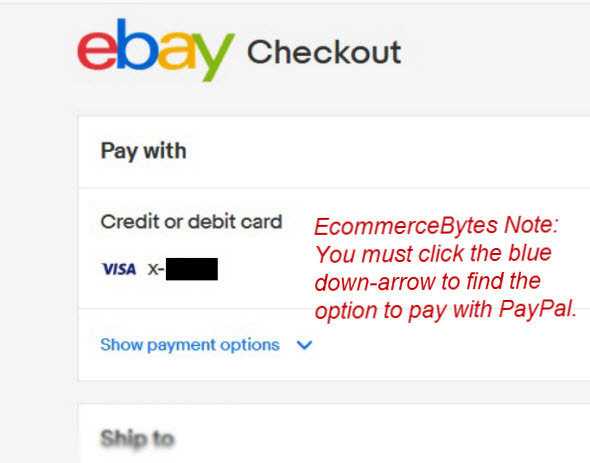 Note the graphic above shows a partial screenshot of the eBay Checkout page. We blacked out the last 4 digits of the buyer's credit card number and added explanatory text in red. There are several unknowns; one is how eBay selects the sellers that display the new design. In both readers' cases, the sellers from whom they were purchasing accepted both PayPal and credit cards. But sellers who are opted in to Managed Payments do not accept PayPal at all, so it doesn't seem likely it's those sellers. That would indicate the design change impacts only sellers who offer their own credit card merchant account - but we've been unable to definitively say that's the case. 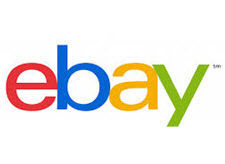 The second unknown is where eBay is pulling those buyers' credit card number from. Is it the credit card number they use to pay their eBay fees? Or is it previous transactions where they used a credit card to pay? "I make about 50 -100 purchases on eBay every month usually business related and today I went to make a purchase and thought at first the seller did not accept PayPal even though it stated he did in his listing, when I clicked the "Buy It Now" button it took me to a checkout page that only showed me the option to pay by credit card, I backed out and went back to the listing and confirmed it said he took PayPal so I hit the "Buy It Now" button again and it still showed that there was only an option to pay by credit card. "I was about to email the seller and ask him why it stated he took PayPal but that option was not there at checkout then I noticed the little arrow pointing down and the "show other payment options" text.. so I clicked the arrow and it was a drop down that had the option for PayPal. "I have never encountered this before so I am assuming this is change within the last couple of days to try and trick buyers into thinking credit card is the only method of payment, I for one having purchased about $30,000 worth of products from eBay last year was almost fooled into falling for it." Thanks to readers for letting us know about the design change and how it impacted them - please share your experiences with eBay Checkout and payments to help us find patterns and see how widespread this is. Unbelievable. Simple unbelievable. Every single day it's something else. They should start their own game show. "Who can guess what changes ebay will make today and win a million dollars!" So from discussion and personal experience it only "hides" the PayPal option when you've made a previous purchase with a card. Still a bonehead idiot move, but what can we expect from a company that's programmed by a troop of drunken monkeys. Just another good reason to not shop on Greedbag. I have been noticing this for a while now. The "credit card" that they have on file for me is my Paypal debit card. That should be the ONLY card you EVER give to ebay. Do not EVER trust them with anything that matters. Desperate times... (hence them hiding paypal). How else could they ever get anyone to be stupid enough to only use a cc when buying on ebay. Again, NEVER trust ebay with anything important. I would hope Paypal would have something to say about that. While Managed Payments excludes PayPal, those not sucked into the vortex are supposed to have all our payment options shown. Hiding listings, hiding the PayPal button, what's next. I had a customer email me last week when I was on vacation asking where my items were. It showed 0. My items are all BIN's and are always seen, or so I thought. If I'm not selling, I'm NOT buying! Its all about the Benjamins. eBay makes more money when they cut Paypal out of the equation. Paypals piece of the action (since eBay is the San Jose mafia) goes to the big boss - DW. It pays for the jet fuel, the big houses and the perks to BOD members. Not suprising at all - as eBay and Paypals agreement winds down, eBay is getting more aggressive in making Paypal "just go away". Paypal cant audit eBays listings - so they will never know that they are hidden in checkout. "Dude, if eBay will hide a sellers listings, why wouldnt they hide Paypal at checkout"? Okay, I just ran a test on one of my items using a neighbors computer and checking out as a guest without logging into the site. None of my listings are set up for anything other than PayPal so how is it there is an option for credit card at checkout? We are not signed up for Managed Payments and I don't have our merchant account set up or linked to Ebay... what if I had completed the purchase how would I have been paid? Are they sending the money to PayPal from Ebay themselves? This is some sneaky crap by Ebay to fool buyers into thinking credit card is the only way to pay. The threat of it is why we have had someone working on our own website for the past 8 months. Things are just getting crazy. As a guest, the Credit Card option is always presented, nothing new, nothing sinister going on. Ebay has no way of knowing what you have for accounts because you didn't sign in, so you get the full menu of options - PayPal, PayPal Credit (maybe you have it), and just your plain vanilla Credit Card. Maybe you don't have a PayPal account, but you don't have to have one to pay with a credit card through PayPal. Credit cards can be processed THROUGH PayPal on a one-time basis without committing to opening an account. My wife does it all the time. No PayPal account, but just pays with a credit card as a guest, via PayPal. In your experiment, it would have been good if you had clicked on Credit Card to see where it brought you. It might have stayed on eBay, now that they take payments. Last week, I paid for an eBay order with a credit card NOT associated with my PayPal account because that was the card I wanted to put the purchase on. The Seller couldn't have been on MP, because all PayPal options were available to me. When I made the payment, it was definitely through eBay, no sign of it involving PayPal at all. I was asked if I wanted to keep the card on file with eBay, but I didn't do that. Got my receipt through eBay, incorporated into the Order Confirmation, not a separate email like you would get using PayPal. When I checked my card statement, the payment recipient was listed as PayPal with a portion of the seller's username, like it usually is. Apparently it does go over to PayPal, or did in this case. It seems that there are several configurations that eBay is presenting at checkout. Showing only the generic Credit Card option, and then making you open a drop down list for other options, is more than a bit underhanded, but that's eBay. Set aside for a moment, if you can, the fact this 'change' appears to be yet another in an incessant series of tweaks eBay has been doing for years now, without announcement or explanation, and in completa contradiction to their previously announced 'promise' - made more than once - to not do such. That itself is bad enough. But such disrespect for their seller's needs to enable effcient adaptation should no longer be surprising. In this case however, there is clearly a motvation behind why they would prefer NOT to call undue attention to another incessant change. It relates to a single word. Weaning. For what is the best way to accustom someone to something different than they have grown fond of - or at least were compelled to accept? You hide it. You deny it even existed best you can. And eventually the 'infant' comes to adapt. Much the same way they do to so many listings. Out of sight, out of mind. So all an intelligent person has to do is READ to find the right payment method. Those that can', won't or expect Feebag to do the right thing get want they click on. Been happening to me for over 6 months now. When you go to pay they have the credit card already clicked. To change that, they then give you the drop menu, so then you pick paypal. HOWEVER... They then have your BANK ACCOUNT already checked on the paypal instead of the paypal balance! (Of course they want you to use your bank account so that you have money left in paypal to spend even more on Ebay and other places!). Been trying to change it for months. When I do change it, IT CHANGES BACK! Very annoying! The problem I have been having is that I CAN'T open the drop down list of payment methods. I'm not sure if it's because I am using Firefox, but the link is inactive. My only way around it is to ''pretend'' to select another address. Once that is open, the other link works. A hassle, but now I know what to do. I figure it will correct itself the next time they change things, which is about every 15 minutes. I purchased some magazines from several different buyers last week. I never noticed the PP link whatsoever. I don't think it has anything to do with the sellers as such as one had a message that they ONLY took PP. I just never noticed the little arrow to pay via PP. When I was shopping the other day, I set my search for lowest price and US only. When I finished looking at the first page and went to the second, suddenly I was seeing UK and AU listings as well as listing that had nothing to do with what I was looking at. So I had to reset things back to what I wanted. Then I got the You bought this item emails with the cutest little spots of items I might like! I had been looking at cardmaking/papercrafting magazines. Now they thought I had lost my mind and were offering me wrestling, Nascar, Sports Illustrated, and what looked like baseball cards. Every single email they sent me had the same four items that they thought I would like. Apparently, the bots see all magazines as alike and so a wrestling magazine is interchangeable with a knitting one. Where does eBay get its programmers? I dug into it much more heavily today and found that my other half had used my Ebay account to buy something back in November and tried to hide the purchase by using one of our credit cards instead of PayPal so that's why Ebay had the CC info and kept it on file without asking to do so, it was in the account settings under recent "checkout" methods or something like that. I removed it and now the screen is back to showing full checkout options without a drop down menu now. searching on ebay is now officially a total nightmare, they are absolutely nuts, i even get different results depending what browser i use. you're correct no mater what search you now select, ebay resets it, and hides listings, there is no way on earth that this manipulation will help them. buying on ebay is a awful, long process, that ends on amazon. these so called venues always gets to the point where they have to run all other businesses. even long time businesses that have been around many years longer than these greedy venues have. how arrogant to tell businesses of 40 years or better , that we have to tell you how to run your business because you don't. if so , why are we still here , and why is ebay taking a c*ap ?